Advanced Mac users, administrators, and developers who wish to test Mac OS in 64-bit mode can do so with the help of a terminal command. Essentially this will only allow 64-bit applications and processes to run on the Mac, which can be helpful for discovering what (if any) apps, tasks, components, processes, and items may need updating, or could be problematic in future Mac OS releases that no longer offer full 32-bit compatibility. While 64-bit only mode is active, no 32-bit processes will execute at all. 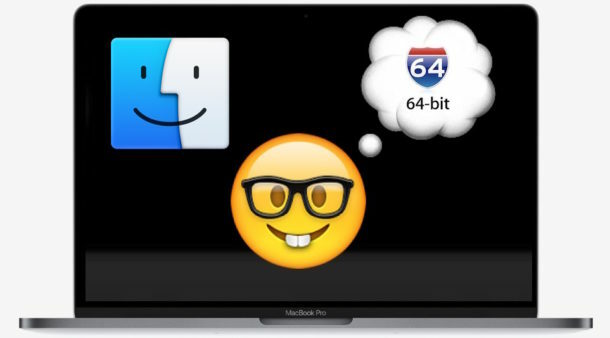 Testing out MacOS in 64-bit only mode requires Mac OS 10.13.4 or later to be installed on the computer, earlier versions of system do not support this capability. And obviously the Mac itself must be 64-bit as well, which nearly all modern Macs (post-Intel switch) are, so if it’s running a modern Mac OS release that is covered. This is truly intended for advanced Mac users who are testing compatibility for a particular reason, novice users will likely find that enabling 64-bit only mode is going to lead to problems with existing software, and thus it is not recommended for most people to test out 64-bit only mode. For the majority of Mac users, simply finding 32-bit apps on their Mac, updating those apps when possible, and understanding the implications of future Mac OS releases not supporting 32-bit apps is sufficient. Note that once you’re in 64-bit mode, no 32-bit process will launch or work. That includes any 32-bit apps, software components, Dashboard widgets, web plugins, preference panels, background tasks and processes, and anything else that is 32-bit. If you try to open a 32-bit app when in 64-bit mode, the app will fail to launch and show a message stating the app can not be opened. Noteworthy is that in prior macOS 10.13.4 release notes, Apple has indicated that 64-bit only mode may eventually provide additional developer-centric information to help test apps and software, but that does not yet appear to be implemented. Disabling 64-bit only mode just puts the Mac back where it was before, which is able to run 32-bit apps but with a warning about future compatibility and performance. In the not too distant future, it’s likely that 32-bit apps will soon not work at all in upcoming Mac OS system software releases, which is why it’s important to either get necessary software updated to be 64-bit, or perhaps just avoid future MacOS software versions that do not offer full 32-bit support and compatibility. As mentioned before, you can always get a list of 32-bit apps on a Mac, and that doesn’t require using 64-bit only mode or any other complex task. Losing 32-bit app support is not totally unusual, as iOS abandoned 32-bit apps not too long ago, and it seems clear that Apple wants to do the same move to 64-bit only with MacOS as well. And for a little background, Mac OS itself has had 64-bit kernel support since Snow Leopard, so this is hardly a sudden shift in technology. If you’re concerned about software compatibility and 64-bit only versions of Mac OS, you can always avoid the MacOS High Sierra updates completely, along with any other future MacOS system software releases that are likely to lose 32-bit support, at least until you have replacement software or have another solution worked out for a particular environment.